I haven't passed the "old" test when I look at the eight rows of pole beans I accidentally planted. On my honor: I DID NOT know they were pole beans! I was just trying to be efficient and use up all my seeds. Waste not, want not, right? Now I'll be stringing up bean plants and then stringing the beans for the rest of my useful days. I am not looking forward to this as a way to keep busy. That was Antoinette's test and I have not passed it. Hurray! I am not old yet! 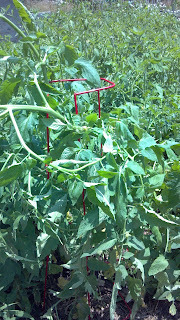 The beans are right behind the 200 indeterminate tomato plants. Why didn't anyone stop me? 200 divided by 2 = 100 days to contain the tomato plants. I broke down and special ordered more of the well-designed but untested tomato cages. They were $8 each. But Wait! There's more! Cucumbers and luffa sponges too! I may be mowing around them soon to contain their enthusiasm. This is an example of why garden planning is so important and impulsive planting is the parallel to impulsive buying. Who hasn't tried to plan a vacation around the six different colors of deck shoes, purchased on sale? The hardware store will have to order more lumber to build this many trellises. It's time to ask for ideas. Cheap ideas.